Amada America recently introduced the FLW 4000 M3 4-kW fiber laser, designed for high-speed precision welding while providing substantial electrical savings. Continuous-waveform welding ensures high-speed, smooth results that cannot be achieved by pulse welding, even when processing reflective materials such as brass and copper and combinations of dissimilar materials. The FLW boasts a patented rotating lens—rather than the laser beam being aligned with a specific point along the target path, it instead circles within a small area as it welds. This feature allows the beam to bridge relatively large and uneven joint gaps while producing clean, even welds. 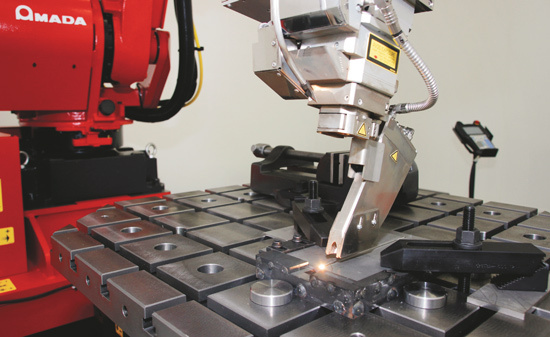 Heat input into the workpiece material is optimized and results in precisely defined weld edges with virtually no unnecessary deposits of weld metal. This reduces or eliminates the need for secondary finishing. • Automatic beam focus—Adjusts the focus lens to an optimum setting based on the set welding conditions. • Teaching assist system—Uses a high-resolution CCD camera to accurately compensate for deviation from the targeted welding path. 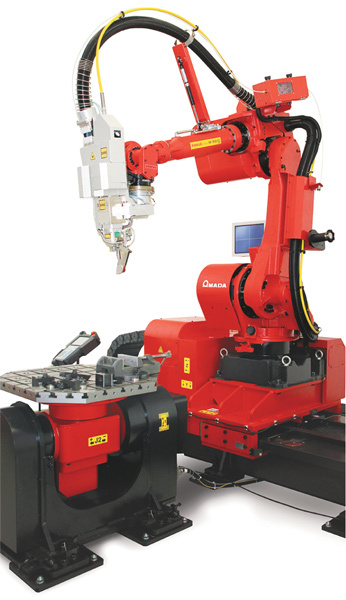 • Amada’s FLW-CAM software—Improves efficiency through offline robot teaching, as well as positioner-table programming. • A safeguard enclosure—Meets all appropriate laws and regulations to ensure user safety. • The AMNC/PC’s touchscreen interface—Simplifies operations and maintenance. The controller houses a library of optimized welding conditions; includes a scheduler tab that allows the scheduling of multiple programs; and prepares automatic e-mail notifications of jobs in progress and maintenance intervals.